On arriving at the First Floor Gallery, visitors can admire a compilation of paintings and artefacts before moving on to the Clan Room, devoted to the history and development of the Clan Campbell. 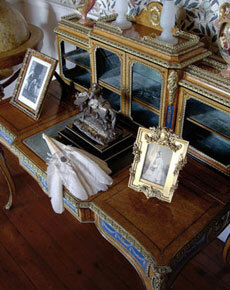 In the Victorian Room, the principal feature is a Maplewood writing desk given by Queen Victoria to her daughter Princess Louise on her marriage in 1871 to the Marquess of Lorne, later 9th Duke of Argyll. A gruesome and ghostly chronicle of the bloodthirsty past, divulged in the MacArthur Room, haunts the elaborately carved four poster bed, once the state bed of the MacArthurs of Loch Awe. Leading from the MacArthur Room, the exhibition of photographs and articles in the Picture Turret depict the recent past including the wedding of the current Duke to Eleanor Cadbury and other family occasions. Portraits in the Gallery include The Duchess of Sutherland, whose daughter married the 8th Duke of Argyll, by Winterhalter; the present Duke's grandfather Ian Douglas Campbell by Cowan Dobson; and Lt. Col Duncan Campbell of Lochnell who raised the 93rd Highlanders, after Raeburn. 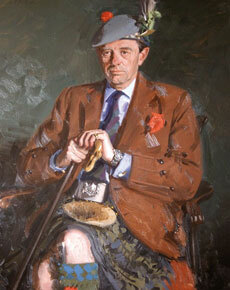 There is a portrait of the 12th Duke by Andrew Festing, this is now in the Entrance Hall. The Clan Room conveys the many fascinating historical aspects of the great Clan Campbell, from its origins right through to the present day, with the Duke of Argyll as Clan Chief or MacCailein Mor. The room includes the remarkable and detailed family tree which adorns the South Wall and traces the Campbell lineage and its various branches of the family from the present day back to Colin the Great in 1477. A map of Scotland shows the lands possessed by the Clan at the height of their power. In addition to most of Argyll, the Campbell strongholds stretched as far East as Taymouth in Perthshire, a castle which in many ways replicates Inveraray; North to Cawdor Castle in Inverness-shire; and South to the now ruined Louden Castle in Ayrshire. There is also a fine collection of military drums loaned by the Caledonian Schools Trust. The Victorian Room is a tribute to the marriage between HRH Princess Louise, daughter of Queen Victoria and the Marquess of Lorne, who subsequently became the 9th Duke. 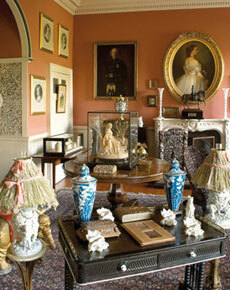 A portrait of Princess Louise, Duchess of Argyll hangs in the room just above the fireplace. Other pictures include a painting of the State wedding ceremony in 1871 in St. George's Chapel, Windsor. Items on display include a porcelain figure of Queen Victoria at her spinning wheel, sculpted by Princess Louise, a talented artist and sculptor. There are also two intriguing pieces of furniture converted from an old coach presented by the Duke of Sutherland to the 8th Duke of Argyll. 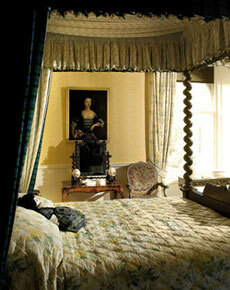 The ghostly bed in this room is elaborately carved and belonged to the MacArthurs of Loch Awe. Legend has it that a young Irish harpist was murdered by the Duke of Montrose's men in 1644. The bed was moved to the present castle from the old Inveraray Castle and the boy's ghost was so attached to the bed it travelled with it. When a member of the family is about to die, it is said that harp music is heard coming from the room. The castle has a number of ghosts including the 'Grey Lady', only seen by daughters of a Duke of Argyll, a floating ship or ‘Galley of Lorne' which moves away on the horizon on the death of the Duke and a raucous kitchen maid. There are a number of paintings in the room including Scottish School portraits of Anne Nasmyth of Posso, wife of John Callander of Craigforth, later Campbell of Ardkinglas and her two children. There is a fine portrait by Gavin Hamilton of famous London beauty and society hostess Elizabeth Gunning, known as the 'Double Duchess' after her consecutive marriages to 6th Duke of Hamilton and 5th Duke of Argyll. Leading from the MacArthur Room, the Picture Turret contains photographs, press cuttings and up to date memorabilia of the family. These include pictures of the present Duke as Marquess of Lorne, his wedding to Eleanor Cadbury and their son Archie, the present Marquess of Lorne. Other displays include pictures of the Dowager Duchess, the wedding of Lady Louise (the Duke's sister) to Mr Anthony Burrell and the funeral of their father the 12th Duke, recording his last journey as he sailed to Innishail to be laid to rest beside his father, the 11th Duke. The Picture Turret also has pictures of HMS Argyll. There is a very strong link between the ship and the castle and three Royal Navy ships have had the name, the first dating back to 1715 which was a 50 gun fourth rate frigate, the second a Devonshire Class armoured cruiser launched in 1904 and now the high-tech duke class frigate commissioned in 1991.